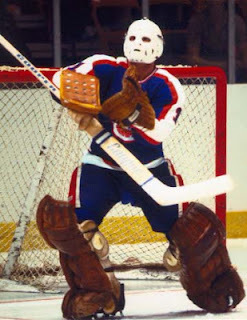 Kicking it old school this week, we go to the start of organized hockey in North America and to a time where goalies had a rough times finding work, then keeping work, then searching out more work-- which could be across the country for some. That's what this week's AGM did, searching west before finding his niche. This week, the profile of Bert Lindsay. Starting off with the McGill University Redmen, Lindsay played three seasons from the 1903-04 season until the 1905-06 season, posting a 5-7-0 record in his 12 appearances before moving onto the semi-pro ranks. 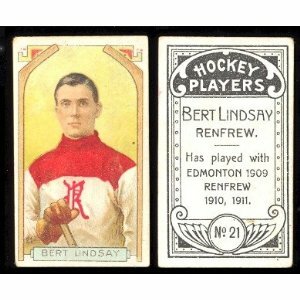 In the 1906-07 season, Lindsay played for the Renfrew Rivers and the Latchford Pros. During the 1907-08 season, Lindsay played four games for the Renfrew Creamery Kings and went undefeated, as well as playing for the Brockville Invincibles, winning the only game he played for them in. With the 1908-09 season, Lindsay started with the Edmonton Professionals, playing in three games as exhibition and winning them all, as well as being in net for Edmonton's challenge for the Stanley Cup; which they would lose to the Montreal Wanderers in their two game match-up. Also in 1908-09, Lindsay played again for the Creamery Kings, going 6-0-0; while also playing a game for the Strathcona Pros in an exhibition game, which was a loss. With the newly formed NHA, Lindsay would play with the Renfrew Hockey Club in the 1909-10 season, finishing with an 8-4-1 season in 13 games. For the 1910-11 season, Lindsay played in 16 games with Renfrew and would put up an 8-8-0 record for the season. Though he was picked up by the NHA's Toronto Tecumsehs, Lindsay moved out west to play for the Pacific Coast Hockey Association's Victoria Aristocrats in the 1911-12 season, going 7-9-0 in his first season there. For the 1912-13 season, Lindsay went 2-1-0 in three exhibition games, while the season for Victoria brought him a 10-5-0 record in 15 games, allowing him to be named to the PCHA All-Star team. During the 1913-14 season, Lindsay had another 10-win season (10-6-0) and help lead the Aristocrats to the Stanley Cup challenge against the Toronto Hockey Club, which they would lose all three games they played. It was a very down year for Lindsay in the 1914-15 season, posting a 4-13-0 record in 17 games, while also going 0-2 in the games he played with the PCHA All-Star team. Moving back east, Lindsay signed on with the Montreal Wanderers of the NHA, posting a 10-13-0 record in the 23 appearances in the 1915-16 season. For the 1916-17 season, Lindsay had a 3-12 record for Montreal. Lindsay and the Wanderers moved to the newly formed NHL in the 1917-18 season, but they only played six games, in which Lindsay played four (1-3-0) before their arena burned down and they were unable to finish the season. After an abrupt end to the previous season, Lindsay signed on with the Toronto Arenas for the 1918-19 season, playing in 16 games with a 5-11-0 record. After that season, Lindsay would retire from hockey. Lindsay was the father of Hall of Famer Ted Lindsay and passed away in November of 1960. While he went back and forth in the leagues in order to find work, Lindsay was able to actually get into a couple of Stanley Cup challenges, despite not winning either. Yet, as he went along, it got a little rougher as more competition came though the PCHA and NHA. Not the best goalie, but a serviceable one who got the wins he could with the team in front of him. The brain-trust over at The Fourth Period, Dave Pagnotta and Dennis Bernstein, have said that they may have found out of some plans to have not one, not two, but THREE outdoor games in the NHL starting as soon as next season. Pagnotta and Bernstein say there could be a series of outdoor games to co-op the losses of revenue from the lockout and the players going over to Sochi, thus eliminating the All-Star Game. Next year's Winter Classic will be the rematch of the game that never happened-- Maple Leafs and Red Wings from the Big House at the University of Michigan. The other places that have been discussed, as Pagnotta and Bernstein have put out there, are Los Angeles (Dodger Stadium) and New York (Yankee Stadium). Of course, this is all brainstorming at this point, as nothing has been made available to the general viewing public, but it would make up for lost revenue and bring more attention to the NHL as a whole should this ordeal come to fruition. The multiple games would give more shots to teams that may not be able to have outdoor games, as well as bring in more of an audience for the spectacle. Though, the biggest question right now is does this oversaturate the specialness of the Winter Classic and the special date on the calendar it has for many hockey fans. Granted, there are a lot of people who love the outdoor game and would enjoy having multiple occurrences, but will that last for long?? I've always been of the proponent that you'll soon run out of markets that could handle an outdoor games, thus making it more limited-- but the league starts to have three games and kill three markets at a time-- how much longer could it last?? It's not as if we haven't seen problems, either. 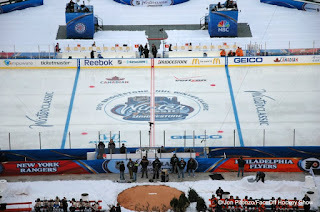 It was too cold in Calgary for the Heritage Classic, there has been weather delays, postponing the start of the games, and overall-- while a successful gimmick in the end-- may overwork those people who have to put the ice together and break it down to take it to the next placement. Dan Craig can only do so much in the allowed time he would need for each venue and a limited window in each market to have the perfect ice so that it's playable and not a danger to the players involved. Would people clamor to go to the games?? Of course, it's an amazing event and something that many would want to see. The multiple locations would give more fans a chance to see it on a regular basis without having to break the bank on travel. The idea would make up for lost revenue and maybe create new revenue streams to help the league make up for lost money during the lockout. That said, how many times a year can the NHL go to the well and expect a waterfall of money poured onto them. While in theory it's a great, if you start to take away the unique nature that the Winter Classic (and to a lesser extent, Heritage Classic) has brought to the NHL lexicon, it's starts to possibly devalue the whole thing, leading people to not care as much for missing the outdoor games because they would know that there's another one coming up later in the season. 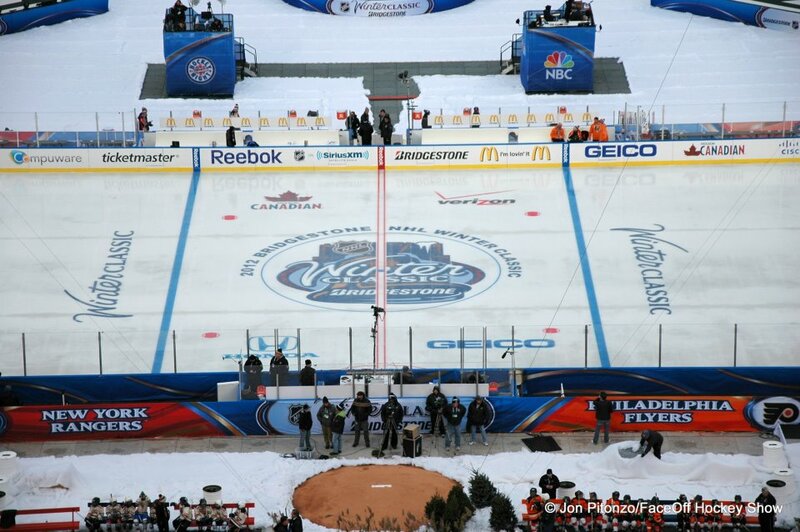 Leave the Winter Classic as it is and let's not try to give everyone an outdoor game a year because there will be a time where the gimmick has run its course and it's back to the drawing board to think of something better to make money. You can call me crazy all you want, but I think Rick DiPietro could still be a serviceable goaltender in the NHL....if it wasn't for that pesky long-term contract. Of course, if this leads to some sort of amnesty buy-out, then it may be worth it to take a flier on him as a free agent. The onus of DiPietro is the contract and the history of injuries he has had in the past half-decade. Yet, many forget that after signing that contract he had a career year with a 32-19-9 record. Granted, he's been limited to 50 games (including this season) since 2008, but beforehand, he was a decent goalie-- maybe not for the length of contract, but at $4.5M-- the price was right and would probably be right in this climate. Yet, it's hard to separate DiPietro the goalie and DiPietro the contract. With another eight years left on the 15 year deal, many teams aren't going to pick that up, especially since he hasn't been able to be effective in those 50 games (14-27-7)-- which may not make him worth that money, either. That's where the amnesty buy-out could be the only way to get around getting DiPietro off the books, though the Islanders would need that to stay at the salary floor. Despite the defense of the Islanders not necessarily being the best, DiPietro didn't do himself any favors when it comes to holding down the Islanders net. His performance may also be tied to the coaching, condition, and handling of DiPietro, as well as the on-going revolving door of goalies-- picked up through waivers and stockpiled in the minors-- that the Isles have had. It can't help an already fragile goalie mentally to know that there's five or six guys gunning for his spot-- thus makes him overwork and over-conditioning and leads to injuries. Would he be an asset in a better system and a better way of life?? Only without the contract he currently has. That's the only way that DiPietro will get the fair shake he needs to get his career back on track. 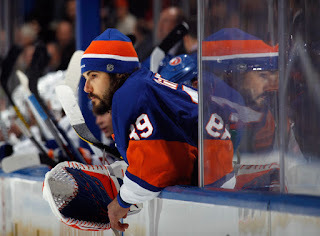 However, he's also 31-years-old and that contract will continue to weigh him down if the Islanders cannot deal him and it would be another disappointing footnote on a career of a goalie that had so much promise before his debut. With Jim Toth of CJOB in Winnipeg breaking the story that True North Sports and Entertainment has been in talks with an unnamed WHL team to bring them out to Winnipeg and play out of the MTS Centre, it has made people wonder how legit it could be and if it could actually work. To counter the reports of Toth, Gary Lawless couldn't get a quote out of TNSE's spokesman Scott Brown and said that it wasn't discussed during the WHL Board of Governors meetings in Las Vegas last month, but there could be a lot of merit to the reports and wouldn't be a bad idea considering how well the Calgary Flames and Edmonton Oilers have done with their WHL teams housed in their arenas. While Winnipeg has been on the WHL radar for a bit, they would instantly the most Easterly team in the WHL, as it is 133 miles east of Brandon and the Wheat Kings. That would great the rivalry geographically, but overload the East Division with seven team, unless you want to break-up the Saskatchewan team, throwing one in the Central Division. Regardless of that, the real mystery is what team was discussing, as little as it may be, with TNSE to move to Winnipeg. For me, there's really only one option and that's the Prince George Cougars. When you look at the team, they haven't been the best when it comes to the attendance figures (steadily down since 2000-01), the team hasn't been the best product on the ice (especially with captain Alex Forsberg wanting off the team and not getting it), as well as them being pretty far out there when it comes to traveling, which would strain the budget of the owners just a bit. This year, the Cougars have only had four of their 30 games have had over 2,000 people in attendance in the 5,582 seat CN Centre in Prince George. Outside of Prince George, I can't think of another team that would be in the market for moving out of their region, mostly because they are set-up nicely and actually having a better than status quo season when it comes to their attendances. At least, no one has been outwardly concerned with their attendance figures in the WHL. Yet, even though TNSE said almost a year ago that they weren't interested in a WHL club, they seemed to have turned the corner with the lockout and not seeing hockey at the MTS Centre. Also, they probably wanted to gauge the return of the NHL and surveying the fan base in order to see what kind of interest they would have in order to forge ahead with any kind of plans. It hasn't happened yet and may take some time, but I think the WHL would wanted the presence in Winnipeg for their Eastern crowd and make their league more profitable. With teams succeeding in three NHL markets already (the two previously mentioned and Vancouver), adding a fourth that could be successful would be another notch in the WHL belt. There were a good amount of odd names when it came to the NHL expansion era and this is another one. While he was destined for minor league purgatory, this week's AGM was able to latch on with an expansion team and get some time in the NHL, even though it didn't show off his best skills. This week, the profile of Pierre Hamel. Hamel started off in the 1969-70 season, playing for a Junior B team in Quebec, St-Victor Voisons, before getting called up to the QMJHL's Verdun Maple Leafs-- appearing in 15 games and posting a 4-9-0 record. Playing 46 games for Verdun in 1970-71 yielded a 19-25-1 record for Hamel. In the 1971-72 season, Hamel was moved to the Laval National, going 3-12-0 before being traded to the Drummondville Rangers, where Hamel would pick himself up finishing with a 23-9-1 record in 36 games, then going 4-4 in the playoffs. Graduating from Junior hockey, Hamel moved to the senior ranks with the Trail Smoke Eaters of the WIHL. Hamel will spend the 1972-73 and 1973-74 seasons there, before getting a professional chance during the 1973-74 season with the Central Hockey Leagues Salt Lake Golden Eagles, where he would lose the only game he appeared in. During the fall of 1974, Hamel signed with the Toronto Maple Leafs, but would spend the majority of the season in the CHL with the Oklahoma City Blazers, going 22-12-6 in 44 games, while also going 1-2-0 in four games with the Maple Leafs. Full time in Oklahoma City in the 1975-76 season, Hamel played in 39 games and posted a 14-12-6 record while going 0-2 in the playoffs. With the Blazers in the 1976-77 season, Hamel finished with a 5-19-4 record in 33 games. Hamel was moved to the Dallas Black Hawks in the 1977-78 season, going 15-16-1 in 36 games. However, for the 1978-79 season, Hamel got a promotion to the AHL with the New Brunswick Hawks and posted a 18-12-5 record in 37 games, then 1-2 in the playoffs. Hamel also made an appearance for the Toronto Maple Leafs, but didn't factor in the decision. Left exposed in the Expansion Draft, the Winnipeg Jets picked up Hamel for the their inaugural roster, where he would go 9-19-3 in 35 games for the Jets. Back in Winnipeg for the 1980-81 season, Hamel only went 3-20-4 in 29 games and would be sent down to CHL's Tulsa Oilers for nine games and posted a 2-5-1 record. Hamel spent five games with Tulsa in the 1981-82 season and going 3-1-0 before moving to the AHL's Fredericton Express and go 5-15-3 in 29 games. While Hamel played two games for the Sherbrooke Jets of the 1982-83 season in the AHL (1-1-0), he would go overseas to play for Dusseldorfer EG of the West Germany Division 2 league. Hamel came back to North America for the 1983-84 season with the Atlantic Coast Hockey League and the Carolina Thunderbirds, as well as in the 1984-85 season-- playing a combined 74 games for Carolina before hanging up his pads in retirement. Even when he was just supposed to be roster spot filler for the Jets, Hamel did get to see some time in front of a poor expansion team. Overall, it seemed that mediocre performances with mediocre teams was the undoing of Hamel, even in the climate of NHL expansion. With the powers that be in the NHL, NHLPA, IOC, and IIHF meeting when it comes to the NHL's partcipation in the 2014 Winter Olympic Games in Sochi, Russia meeting, the question turns to what's going to happen next for the NHL in the Olympics. Since the 1998 Games, when the NHL first started in the Olympics-- the NHL has lucked out with the Games being in locations where hockey is a followed sport or is close to locations where hockey is a popular sport, sans Nagano. The good part of Nagano is that the NHL was starting to get into Asian markets, even opening up the 1998-99 season in Japan. Yet, with all of this, the Sochi Games could be the end of the line for the NHL's involvement. One of the reasons is that the Russians would want to represent their country at home. Of course, we all remember how many Russians said they would play regardless of the NHL's participation; so to include the NHLers would be the best bet for the NHL rather than losing the fire-power of Evgeni Malkin, Ilya Kovalchuk, and Alex Ovechkin, as well as Anze Kopitar-- who would want to help represent his native Slovenia in their Olympic journey. But after this-- it could be an indefinite hiatus for the NHL when it comes to the Olympics. Past Sochi, there's South Korea in 2018 and 2022 is yet to be decided, but here are some potential bid cities. While the NHL would want to diversify their game, they don't seem to have the bump in Asia that they once had, so suspending the participation would probably happen, despite the IIHF and IOC actually wanting to have those high-profile names in one of the pinnacle events. There's plenty of discussion about whether or not the NHL should be involved at all when it comes to the Olympics, as the whole "amateur" idea of the Games being put into check because of it, even with the exposure it gives to those involved. There's probably also a worry about the time that the NHL will have to take off because of it, the practice after the NHL is back in business, and the worry for some teams down the stretch when it comes to wear-and-tear of their players. In the end, the NHL will go to Sochi and it probably won't take long to hash all of that out. The bigger concern is the involvement past this Olympics, which I'm sure the IOC would be pushing hard for a commitment, especially for a lesser revered venue and trying to get all the star power they could muster. On the Wild's only regulation goal of the night, Jarome Iginla tried to get the puck out of the Flames' zone and it deflected off Ryan Suter's skate and right to Devin Setoguchi. Iginla appeared to be coasting after the blotched clearing attempt, all the while Kyle Brodziak received the Setoguchi pass, made a move and scored. Iginla was the closest back-checking Flame, not looking to make an effort to make a play on it. That's not the mark of a passionate player Not the leadership by example Iginla has been known for. Not what anyone wants in a franchise player. The Fan 960's Rhett Warrener said as much when it comes to Iginla this morning. Of course, if Iginla gets traded, he's going to have to approve it and who knows if he would or not. While he loves being in Calgary, is he more of a detriment to the team than an asset, even as a captain. For a guy who is on the last year of his contract, you don't see the intensity that Iginla has had in the past. 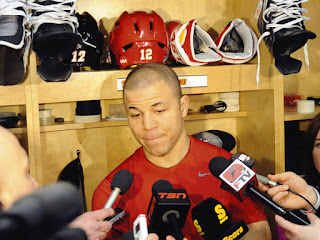 Maybe it's because he didn't intensely skate during the lockout and it's taking a while to get his step back, but he's not showing the signs of being the Jarome Iginla that made him a folk-hero in Calgary and the NHL starting back in the 2004 playoffs. To be honest, Iginla is on a team that he is a superstar on a team who doesn't seem to have much else in the past, which put him into the role that he is in right now. If he gets traded to a contender, he wouldn't be in such a prime role that he is in Calgary. He'd be a depth player who wouldn't be called on to be the superstar player that Calgary fans and coaching think he should be right now. If Iginla wants to be traded, he'll be able to choose his destination and the Flames management will have to work around what he wants because of the No-Move Clause in his contract. Most teams may not see that he still has that spark he seems to be missing, which means little return for the Flames; but are they better off with him slumping and looking out of sort or are they better off without him?? Back in the day, many players and goalies would go through many systems in order to get to the NHL or at least establish an amateur career, as well. This week, we talk about a couple programs that were used before this week's AGM actually got to the NHL. This week, the profile of James "Flat" Walsh. Walsh's first step on his trek was playing for the Kingston Collegiate Institute in the 1914-15 in the OHA junior system, with a 3-1-0 record in four games played. Walsh went into the Kingston Frontnacs' system in the 1915-16 season, splitting time with the junior team and the senior team. From the 1916-17 until the 1918-19 season, Walsh played in the Kingston Athletic Club between the junior and intermediate systems, going 3-0-0 in the junior system in the 1916-17 season and 3-1 in the playoffs; while with the intermediate team in the 1918-19 season-- Walsh went 3-1-0, then 4-4 in the playoffs. Starting in the 1919-20 season, Walsh moved onto the Sault Ste. Marie Greyhounds, who played in the NOHA and NMHL for each season. Combined in the 1919-20 season, Walsh compiled a 10-6-3 record in 19 games; then in the 1920-21 season, Walsh finished with a 20-4-1 record in the 25 games he played. In the last duel season, Walsh played in 20 games with a 18-2-0 record to show. Walsh played only with the NOHA side of the Greyhounds in the 1922-23 season, playing in 8 games and finished with as 4-4-0 record, then went 4-1 during the Allan Cup qualifications. Walsh played seven games in the 1923-24 season, posting a 6-1-0 record, then 5-2 in seven playoff games. While Walsh was rostered in the 1924-25 season, he didn't have record, but moved to the CHL with the Greyhounds and played 32 games, with a single shutout and 3.13 GAA. The 1926-27 season was a rough one to start as Walsh signed with the AHA's Detroit Greyhounds, playing in six games-- all of which were losses. Then the team folded mid-season, leaving Walsh without a gig. That didn't last too long as the Montreal Maroons signed Walsh as a free agents, where he was used as an emergency goalie, playing a single game in both the 1926-27 and 1927-28 season, having a loss to show in those two games that he appeared in. In the 1929-30 season, Walsh was back in Montreal and got the chance to shine when starting goalie Clint Benedict broke his nose and was forced to retire. Walsh stepped in to the starting role and played in 30 games and finished with a 16-10-4 record, then went 1-3 in the playoffs. The Maroons thought that Walsh couldn't handle the duties along, so Walsh split time with Dave Kerr-- Walsh played 16 games with a 7-7-2 record, then played in 27 games for the 1931-32 season, posting a 14-10-3 record and then 1-1-2 playoff record. Also during the 1931-32 season, Walsh played in the Can-Am league for the New Haven Eagles, going 7-9-2 in 18 games. For the 1932-33 season, Walsh played in three games with the Can-Am League's Quebec Castors (2-1-0), then 22 games with the Maroons, finishing with an 8-11-3 record. However, Walsh came down with influenza, which it took two weeks for him to overcome. The fan-favorite goalie was forced to retire because of it. After he got better, Walsh went onto coaching for the Maroons until they folded up. Walsh would pass away December 2, 1959. It took Walsh a while and several programs to get things going for him, but as he moved forward he seemed to progress well. It included a team folding up for him to achieve his NHL dream and when he was there, it seemed that confidence wasn't there for him either. Walsh did leave a lot of fans for his friendly nature, which could be considered a little more valuable, especially in his quick retirement. Can You Figure Him Out?? Fasth?? The legend of Viktor Fasth will start to grow more and more as people will get more exposed to him due to an injury to Jonas Hiller. However, people have started to talk about him enough thanks to his 5-0-0 start coupled with a 1.92 GAA and .932 save percentage. More over, should we really be surprised by this?? Getting over the fact that he's 30 years old and has been in Sweden for his professional career leading into this season, Fasth is really not a unique case study for surprising goalies coming on to take the world by storm. Fasth just joins the group of Johan Hedberg, Patrick Lalime, and Jim Carey (to name a few) when it comes to rookie goalies coming into the landscape and dominating the goaltending stats. While goaltending is often regarded as one of the toughest positions to mature and adjust to, it's also a position where teams can be tricked into a goalie is unbeatable. In a mental game, the goalie who comes into the league without many players knowing his scouting report-- they are often successful in their first long stretch. Lalime is the prime example, as he went unbeaten in his first 16 games (14-0-2), which is a NHL record to begin a career. Hedberg is a guy who got a late call-up in 2001 and went 7-1-1 before helping the Penguins get to the Eastern Conference finals that year, as well. And we all know about Jim Carey. 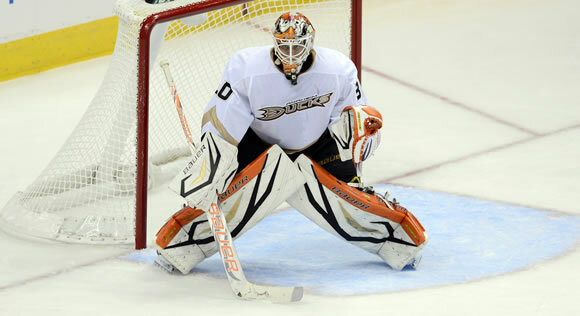 However, that doesn't mean that Fasth will fall into this mold, it's just a precautionary measure. While goalies are able to readapt their game, the use of video is much more prevalent in the game today than it was in the past, so teams will be able to pick up on the changes faster and faster. The best thing working in the favor of Fasth is the fact that the other names I have mentioned came up from the minors leagues or college before actually getting into the NHL. Fasth's disadvantage could have been playing in Sweden on the bigger ice, thus the angles being different. Fasth has seemed to pick up on that quickly, which is working to his advantage. It's a matter of keeping that advantage which only time will tell. While this goalie is a fresh retiree, he does have quite a resume to show. From winning a Memorial Cup to scoring a goal in the IHL, to being in a hip-hop video, this week's AGM savvy nature has made him a great personality in the game and has moved him along to a life in hockey by coaching and technology, as well. This week, the profile of Fred Brathwaite. Brathwaite's start was in Junior "A" in the 1988-89 season with the Smiths Falls Bears, where he would play in 38 games and have a record of 16-18-1, while in the 1989-90 season-- Brathwaite played in Junior "B" for the Orilla Terriers for 15 games before getting a call-up. The call-up for Brathwaite was to the Oshawa Generals of the OHL, where he would finish that campaign with a 11-2-1 record in 20 games, then went 4-2 in 10 playoff games, as the Generals won the OHL title. In the Memorial Cup that year, Brathwaite played one game (a win) en route to the Generals winning the Memorial Cup. In the 1990-91 season, Brathwaite appeared in 39 games for Oshawa and compile a 25-6-3 record, then post a 9-2 record in 13 playoff games. The 1991-92 season put Brathwaite in Oshawa again, but only for 24 games (12-7-2), then he was dealt to the London Knights where he would go 15-6-2 in 23 games, then 5-5 in the playoffs. Brathwaite was on the move once again before the 1992-93 season, where he would play for the Detroit Jr. Red Wings, putting up a 23-10-4 record in 37 games while going 9-6 in the playoffs. Going undrafted, Brathwaite was signed by the Edmonton Oilers before the 1993-94 season, where he would go 3-10-3 in 19 appearances, while being sent down to the AHL's Cape Breton Oilers for two games going 1-1-0. The lockout shortened 1994-95 season had Brathwaite in Edmonton the entire season, posting a 2-5-1 record in 14 games. Brathwaite struggled with Edmonton in the 1995-96 season, going 0-2-0 in seven games before having a stint in the AHL with Cape Breton, where he would have a 12-16-0 record in his 31 games there. With no NHL contract, Brathwaite signed with the IHL's Manitoba Moose for the 1996-97 season, where he would put up a 22-22-5 record in 58 games, but he would record a goal in November of 1996. Returning to Manitoba in the 1997-98 season, Brathwaite had a 23-18-4 record in 51 games, then went 0-1 in two playoff games. Brathwaite moved onto the Canadian National Team at the beginning of the 1998-99 season, playing 24 exhibitions and going 6-8-3 in those games before he would get a solid break. In January of 1999, Brathwaite was signed by the Calgary Flames and would play 28 games the rest of that season, posting an 11-9-7 record along the way. The 1999-2000 season allowed Brathwaite to get starting goalie time, playing in 61 games and finishing with a 25-25-7 record for the Flames, as well as going to the AHL for two games (both wins) with the Saint John Flames; in addition to that-- Brathwaite played a game in the World Championships for Canada, a loss. In the 2000-01 season, Brathwaite played in 49 games for Calgary and went 15-17-10, while on the Canadian team in the World Championship-- Brathwaite played in four games with a 3-1-0 record. During the summer of 2001, Brathwaite along with Daniel Tkaczuk, Sergei Varlamov, and a pick went to the St. Louis Blues for Roman Turek and a draft pick. With the Blues in the 2001-02 season, Brathwaite was a back-up to Brent Johnson and would play in 25 games and finishing with a 9-11-4 record and playing in six seconds of a playoff game. 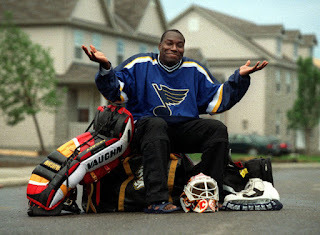 In the 2002-03 season, Brathwaite was a part of a seven goalie system in St. Louis-- playing in 30 games and finished with a 12-9-4 record. Brathwaite signed with the Columbus Blue Jackets before the 2003-04 season and would go to 4-11-1 in 21 games, while playing in the AHL with the Syracuse Crunch for three games and finishing with a 0-2-1 record. Brathwaite went overseas for the 2004-05 season to play with Ak Bars Kazan in the Russian Super League, playing for two years there in 66 games with 14 shutouts in that time. Brathwaite came back to North America for the 2006-07 season, signing with the Atlanta Thrashers, but being assigned to the AHL's Chicago Wolves, playing in 40 games with a 22-13-5 record to show. In the 2007-08 season with the Wolves, Brathwaite only appeared in 13 games (10-2-0) before leaving the team and going back over to Russia to play with Avangard Omsk for 18 games to end out the season. Staying in Europe, but moving to Germany, Brathwaite started out with Adler Mannheim in the 2008-09 season, playing in 49 contests and posting a 27-22-0 with six shutouts, then 5-4 in the playoffs, a performance good enough for Brathwaite to get the German League MVP. During the 2009-10 season, Brathwaite put up a 21-25-0 record for Mannheim in 47 games, then 0-2 in the playoffs; while in the 2010-11 season, Brathwaite went 25-24-0 for a 49 game season, then 3-3 in the playoffs. Brathwaite attempted to get another NHL role, but has been unable to find a spot-- settling for an assistant goalie coach for Adler Mannheim. As well, Brathwaite is the Public Relations director for a new stadium smartphone app called SweetSeat, where fans can order food, drink, or merchandise from their seat and have it delivered to them. With brief promises, the cards seemed to be stacked against Brathwaite-- being shuffled around a logjam of goalies from organization to organization. While he did start out to be a solid prospect, it never turned out-- but he chalked up many miles to keep his dream alive and well, regardless of cost. 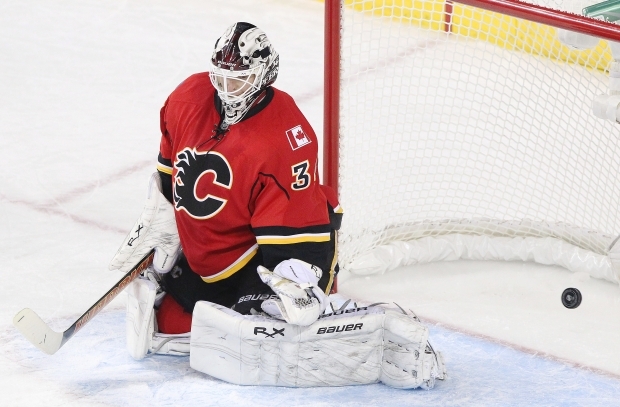 Is it possible for Miikka Kiprusoff to start all 48 games for the Calgary Flames this season?? Long answer is yes, but in doing so; you're not only wearing out your workhorse and maybe not giving your team the best chance to win-- but you're also hurting the development of the young back-up Leland Irving, who won his spot on the bench in training camp. Yet, at the same time-- Kiprusoff is the Flames guy through thick and thin. Since the lost 2004-05 season, Kiprusoff has played in 524 of the Flames 580 games, coming on in relief for only four of those 524. That shows that Kiprusoff is able to give the outcome the Flames want-- in which he hasn't had lower than 35 wins in those seven seasons-- but also shows that the team probably can't play that well in front of the back-up, for which there has been nine back-ups in the seven season span. The problem with Kiprusoff being in there all the time this shortened season is the fact that he's just getting warmed up after not playing or practicing much during the work stoppage. His numbers are showing it, too, with a 3.42 GAA and .859 save percentage in his six games this season, very un-Kipper like for him. Even with all the problems, this sprint of a season is something where Bob Hartley is probably going to live and die with their gamer of a goalie. Odds are, Kiprusoff will not turn down a chance to play when he's asked. That's why at some point, Hartley has to tell Kipper to take a seat and let Irving have a spot. For a young kid like Irving, who has gotten better in the AHL, but being behind Kiprusoff; hasn't been able to make a great NHL splash as of yet. And because of that, Kiprusoff has had to taken the brunt of the starts due to seemingly a lack of confidence in the young back-up. While he has gotten "better" in some sense of the word, the 1-3-2 record isn't helping the cause for Kiprusoff to keep playing every minute of every game. While his experience is something that has worked well in the past, it may not be the best for the team if his struggles are hurting the team in the long-run. Irving may not be the answer, but with the starter dealing with struggles-- the back-up at least deserves one shot.